Former successful Indian skipper Sourav Ganguly autobiography “A century is not enough” which has been written by himself along with co-authored by Gautam Bhattacharya and published by Juggernaut now being circulating around. Ganguly in his book put forward his side of the story when he was being dropped in 2005 as a player from Indian team and also about his experience with Kolkata knight riders (KKR) during three seasons. There is no second thought in it how much “Dada” contributed to Indian cricket by consolidating the whole team and this reflected in 2011 World Cup win when the whole country dripped into the pool of emotions. After 2003 World Cup where India lost in finals against its favorite rival Australia and Ganguly emerged as a powerful and assertive captain by taking Indian team till finals after a poor show in the group match. During this year Ganguly mentioned how he met Chappell, impressed with his dept cricketing wisdom on tour to Australia back then. He thought Chappell would be the best person to help him out in taking avenge of world cup loss against Australia. “In our previous meetings, he had impressed me with his deep cricketing knowledge,” Dada writes in his book. In 2004 when India’s one of the best foreign coach John Wright’s successions as an Indian coach started to speculate, Greg name was first suggested by Saurav. 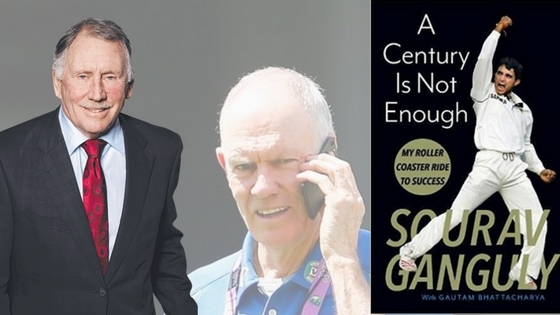 In his book, he recalls how Sunil Gavaskar warned him to have Chappell in Indian side and complication to work with by adding poor record as a coach in the past while suggesting former captain. Apart from veteran batsman Gavaskar, Jagmohan Dalmiya was also against Chappell to be mentoring Men in Blue as stated in Dada’s autobiography how Dalmiya called him one day at his house and shared in confidence that even Ian Chappell younger brother of Greg Chappell being skeptical on his older one as an Indian coach. The God of offside ambushing all warnings and speculation surrounded in the selection of Greg Chappell believed in his own gut feeling and went ahead with his original choice. And in 2005 controversy started to haul as fall out of Indian Captain and coach which till now sometimes still becomes flacon in the minds of Cricket fans. In fact, in the book he writes “This (the year 2005) remains the most turbulent chapter of my life. Not only was my captaincy suddenly taken away for no reason but I was also dropped as a player. I feel angry even as I write this. What happened was unthinkable, Unacceptable, and Unforgivable “. Prior to his six months of exclusion from Team India Ganguly scored a century in a test match, this also couldn’t convince selection committee led by Kiran More. This unceremonious removal of Maharaja not only from Captain but also as player rarely happened in the history of Cricket. Sharing his experiencing of IPL wherein captained the side of KKR own by Shahrukh Khan on two occasions and on one occasion he played as a player. The god of offside shared in his book how as Indian Captain he had a independence to choose playing 11 but this was the first time in the career he had to ask and inform about playing eleven to KKR owner. During his reign as captain of KKR in the first season when the team performed poorly which made him play as an ordinary player in season two and again as a captain in the third season. Though Saurav mentioned good relation with SRK, this reflects subtle hint on the functioning of IPL teams and how this impacts on star players. Till date, no one has come forward and given insight into the offside scenario of an IPL team, especially how team owners and business tycoon control whole management of the team.